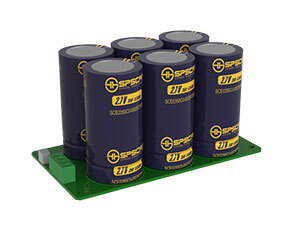 The 15V 60F module is an energy storage module comprised of 6 series connected individual super capacitor singles of which nominal capacitance is 350F. This module includes cell balance voltage management circuitry which can protect each cell from operating in a damaging overvoltage condition. The module has the caution of overvoltage, can be used in solar system.The module is fixed by the positioning hole of four corners, and output by the terminal on the upper surface. The 15V 60F module has funcions, such as cell voltage balancing and voltage alarm.